The San Diego region’s warm and humid climate provides an ideal environment for hundreds of tree species to grow and flourish. Unfortunately, this same environment is also ideal for numerous fungi, bacteria and insects that affect trees and shrubs. Emma Tree Service is licensed as a landscape pest control operator by the State of California and the County of San Diego. We have the knowledge and experience necessary to accurately diagnose the various tree pest problems in our region and provide the correct mitigation options. Aside from pests and diseases, there are numerous problems associated with trees in our region that may be caused by cultural conditions in the landscape. 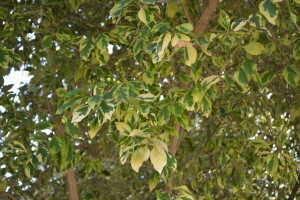 Irrigation problems, root zone compaction, improper pruning practices or other poor maintenance practices, poor tree selection, and competition from other trees or plants are all examples of problems that may contribute to decline in any number of tree species and may further invite secondary problems such as insect infestations. 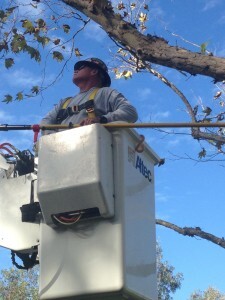 The arborists at Emma Tree Service have years of experience in correctly diagnosing a wide variety of problems which affect local trees and palms, and we pride ourselves on our ability to correctly diagnose the problem the first time and recommend the correct mitigation options.